Before I get on to my latest creation, I want to welcome my new followers - I'm so glad to have you along! My tip is a really simple one - while perusing blogland, I came across a blog which recommended making circular cards by cutting two scalloped circles, scoring a straight line across the top three scallops on the back side of the card and adhering the top of the two circles together with strong adhesive. This being my first ever circular card, I followed these directions without thinking about the physics of it. However, it would work much better if you scored across an even number of scallops - that way, the score line will sit parallel to the table top when the card is propped open, allowing it to balance better. Also, larger scallops would work better. Simon Says Stamp Challenge - Inspired by a song or movie title- I was inspired by the movie Chocolat. The little mouse sleeping on the chocolate cupcake reminds me of the scene where the Comte had a little snooze in the shop window after 'sampling' the display. To go along with the theme, I used the French Pastry Doily and the MME paper with the loops on it reminds me of the swirls that are often used to decorate chocolates. Thank you for stopping by and for taking the time to leave a comment - they are very appreciated. Have a great week! What an adorable card!! Is the little fella on the cupcake in a sugar comma?!! 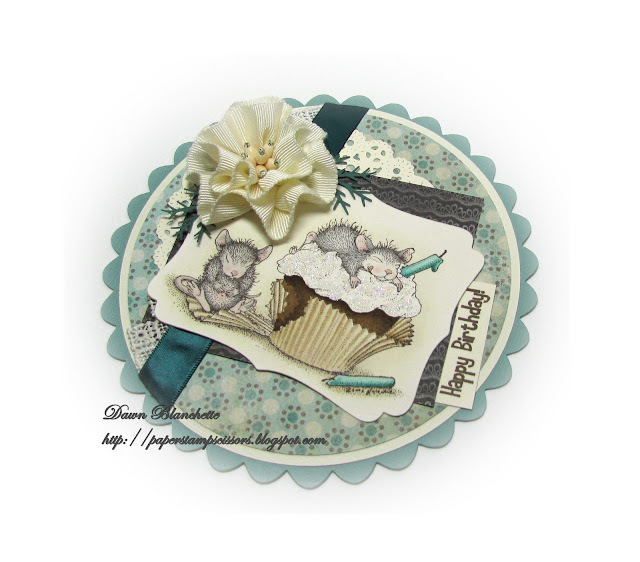 Gorgeous shaped card Dawn with a super cute image and I adore your recycled ribbon flower - it's gorgeous! Thanks for entering my Alter/Recycle challenge over at Allsorts this week and good luck! Hi Dawn gorgeous sweet cute creation lovely colour combo & your flower is amazing lovely image fab colouring so pleased you could join us on our 3rd celebration HM & Friends blog hop chall. Thanks for sharing at Allsorts this week and good luck! Dawn, your card is stunning. The image is adorable and the flower and doily are perfect with it. 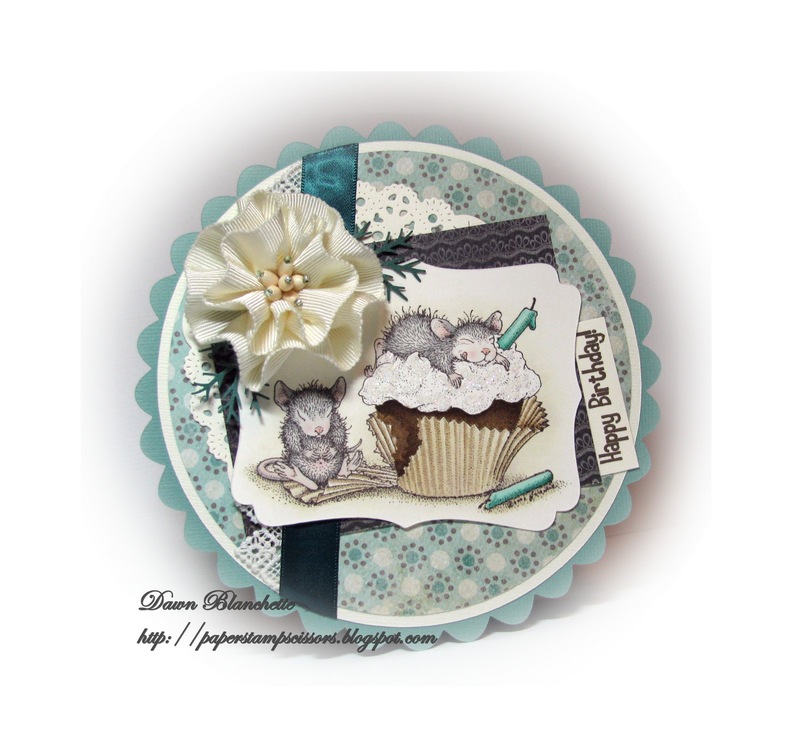 Thanks for joining us for our 3rd birthday celebration at House Mouse and Friends Monday Challenge and Blog Hop. Nicely done. Dawn how totally adorable. Beautiful color combination. Thank you for joining us at FTTC. Love your card and the flower you made is awesome! !